A maple handle that runs while the softening, the curve of bending and slides into a wraparound rear bolster: this is a Laguiole, the thing is heard ! When the eye moves away for a moment, the object is transformed and they are two wings, the silhouette of a mallard duck gliding on the water who discover, the magic worked. It's a knife full of poetry who knows happily married high functionality and power of evocation. Thanks to its broad base, the knife is placed on the table without the blade still touches the surface. Hilton Mc Connico est né à Memphis en 1943 dans l'état du Tennessee, il est à la fois peintre, décorateur, photographe, designer, scénographe. He has received numerous awards for his design which have entered the permanent collections of many museums around the world. 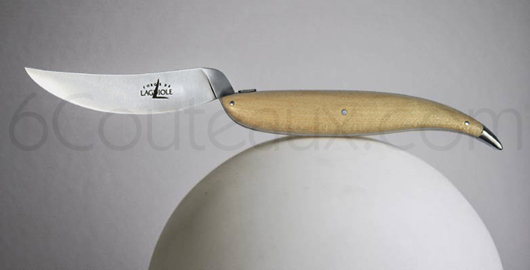 Hilton McConnico create a world steeped in poetry and humor such that knife Laguiole « VIRGULE » (COMMA).